Tony DiCicco is the current Head Coach of the Boston Breakers of the Women's Professional Soccer (WPS) and the CEO and Founder of SoccerPlus Goalkeeper School and SoccerPlus FieldPlayer Academy. He is the former Head Coach of the US Women's National and Olympic Soccer Teams and the Head Coach of the US U20 Women's National Team. In 2008, in his return to international soccer, he coached the US to the FIFA U20 World Cup Championship in Chile. He had previously lead the Full National Team to the 1999 FIFA Women's World Cup Championship, the largest women's sporting event in history. And in 1996, he coached the US Women's Olympic Team to the first ever Gold Medal in Women's Soccer. Former U.S. Women’s National Team head coach Tony DiCicco is one of the most recognizable names in women’s soccer. DiCicco guided the USA to the 1996 Olympic Gold Medal and the historic 1999 World Cup championship, while accumulating a record of 103-8-8 – making him the all-time wins leader in U.S. National Team Soccer history. For six years DiCicco was the head coach of the U.S. Women’s National Team. His 1999 Women’s World Cup squad changed the face of women’s athletics forever, winning the championship over China in front of the largest crowd in women’s sports history (90,185 at the Rose Bowl in Pasadena on July 10, 1999) and a worldwide television audience. He also guided the U.S. team to a third-place finish at the second FIFA Women’s World Cup in Sweden in June of 1995 and championships at U.S. Women’s Cups in 1995, 1996, 1997 and 1998. DiCicco and the USA Women’s National Team also won the Goodwill Games Gold Medal in 1998. The 1996 Olympic Gold Medal team has recently been inducted into the United States Olympic Hall of Fame. After the World Cup triumph, DiCicco served as the WUSA’s COO in 2001 and its Commissioner in 2002 and 2003, and the Chairman of the Re-launch committee in 2004. Most recently, DiCicco served as head coach of the U.S. Under-20 Women’s National Team, guiding the Americans to the 2008 FIFA U-20 Women’s World Cup championship in Chile. 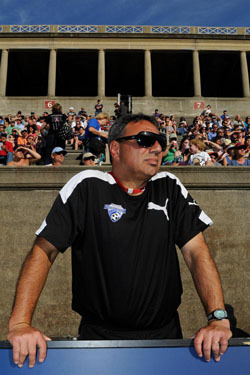 DiCicco is the dean of the WPS coaches' club, having led the Breakers since their inception prior to the 2009 season. With seventeen WPS wins, DiCicco has the second most coaching victories in WPS history, behind former FC Gold Pride top man Albertin Montoya (20). In 2010, DiCicco's Breakers squad finished 2nd in the WPS standings and earned a semi-final berth in the WPS playoffs before falling to the Philadelphia Independence. A 1970 graduate of Springfield College (Mass. ), DiCicco majored in physical education. A goalkeeper, he was the captain and most valuable player his senior year, earning All-America honors. DiCicco played five years of professional soccer in the American Soccer League with the Connecticut Wildcats and Rhode Island Oceaneers, where he was team MVP and captain. In 1973, DiCicco toured and played for the U.S. National Team. In 1981, DiCicco founded SoccerPlus Goalkeeper Schools, which has grown to over 20 camps nationwide, and started the SoccerPlus FieldPlayer Academies in the summer of 1998. He has served as the goalkeeper specialist for the National Soccer Coaches Association of America (NSCAA) and has conducted both U.S. Soccer and NSCAA national licensing camps. He holds both the U.S. Soccer “A” license and the NSCAA Premier Diploma. DiCicco founded the FSASoccerPlus Football Club in 2003 and serves as the club’s Technical Director. DiCicco, who was appointed as a member of the FIFA Panel of Instructors and Lecturers for Coaching visited Santiago, Chile to help promote the FIFA U-20 Women’s Championship. He has authored three soccer DVD series, Goalkeeping, the DiCicco Method; The 3 front System 4-3-3; and Champions Soccer Series featuring Brandi Chastain and has completed a book, along with Dr. Colleen Hacker entitled “Catch them Being Good”. DiCicco started soccer programs at Bellows Falls Middle School in Bellow Falls, Vt., and South Catholic High School in Hartford, Conn. He also coached the Hartford Hellenic and the Hartford Italian Stars of the Connecticut Senior League and served as an assistant coach for intercollegiate men’s programs at Central Connecticut State University and the University of Hartford. He is a 1966 graduate of Wethersfield High School in Connecticut, where he lettered in soccer, baseball and basketball. During the 2003 and 2007 FIFA Women’s World Cups he worked on the TV crew for ESPN and at the 2000 Olympics DiCicco was an analyst for NBC. DiCicco has also recently started SoccerPlus Education Center, a non-profit company that provides seminars, leadership and outreach programs for young student athletes. In March of 2012, Tony DiCicco was honored by being elected to the National Soccer Hall of Fame with fellow inductees and US Soccer stars, Tony Meola and Claudio Reyna. He resides in Wethersfield, Connecticut with his wife Diane. The couple has four boys, Anthony, Andrew, Alex and Nicholas. In his spare time, he enjoys the outdoors, golf, skiing, reading and spending time with his family.